This sturdy DMI shower chair will provide welcome relief if you have trouble standing or worries about falling in the shower. Shower with confidence knowing you have a stable place to sit. This bath chair will make showering easier and safer for people with disabilities, older people or those recovering from surgery or injuries. The chair's frame is made from aluminum which is incredibly strong yet lightweight. The shower chair weighs only 13 pounds yet can support up to 350 pounds. The textured seat has drain holes so water won't build up. And the suction cup rubber tips are slip resistant, giving the chair firm footing on wet surfaces. Add extra seating to your living space with this set of two stylish accent chairs. These versatile accent chairs feature a neutral colour scheme that easily complements existing furniture pieces and effortlessly blends in with almost any dicor. Nail-head trim and tufted backs add a touch of visual interest, while webbing seat construction offers relaxed support you can sit back into. Practical as well as comfortable, the chairs are constructed with sturdy pine and have polyester fabric covers that are easy to clean and maintain. A great fit for any room in the home, this set delivers effortless style and a convenient seating solution. This commercial grade banquet chair with trapezoidal back design fits well in formal and casual settings from wedding ceremonies to corporate meetings and awards banquets.The chair's cushioned back and 2.5 inch thick seat are padded with CA117 fire retardant foam. Its sturdy, 16 gauge steel, powder coated frame, with gracefully angled legs, has been tested to hold up to 500 pounds. Double support braces reinforce the frame to give it great strength and durability. Bumper guards prevent scratches on the frame when stacked (up to 15 high) and non-marring floor glides protect your floor by sliding smoothly when you need to move the chair.This durable Banquet Chair is an excellent option for churches, banquet halls, training rooms, hotels, convention centers and schools. 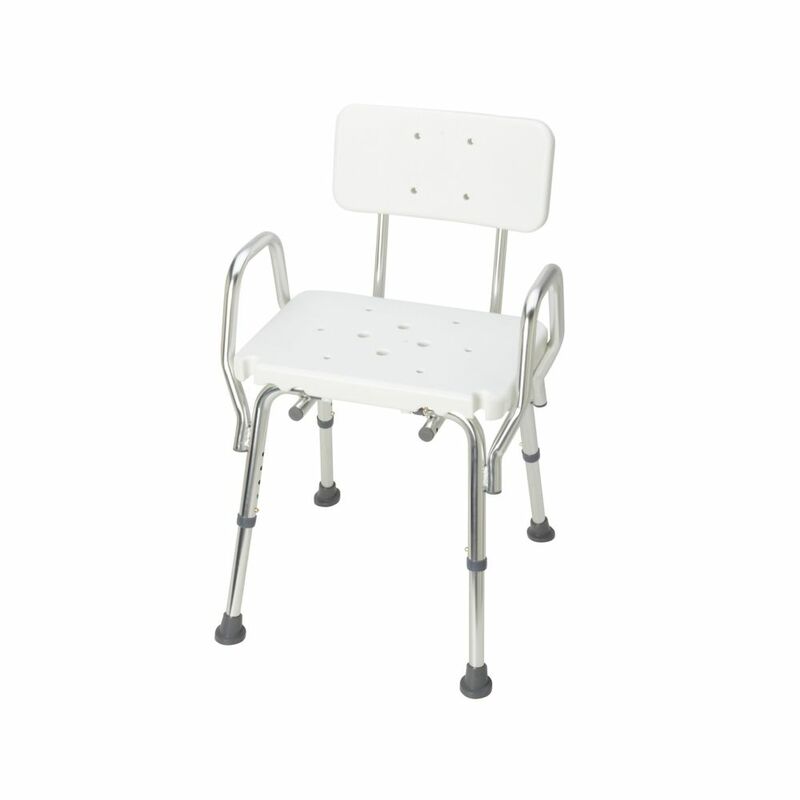 Heavy Duty Bath and Shower Chair with Backrest This sturdy DMI shower chair will provide welcome relief if you have trouble standing or worries about falling in the shower. Shower with confidence knowing you have a stable place to sit. This bath chair will make showering easier and safer for people with disabilities, older people or those recovering from surgery or injuries. The chair's frame is made from aluminum which is incredibly strong yet lightweight. The shower chair weighs only 13 pounds yet can support up to 350 pounds. The textured seat has drain holes so water won't build up. And the suction cup rubber tips are slip resistant, giving the chair firm footing on wet surfaces. Heavy Duty Bath and Shower Chair with Backrest is rated 4.8 out of 5 by 6. Rated 5 out of 5 by Janice from No drill required. Easy to assemble. Sturdy, feel safe using this while taking a shower. No drill required. Easy to assemble. Sturdy, feel safe using this while taking a shower. Rated 5 out of 5 by Jackie from Great Choice Very easy to assemble. The chair is comfortable and sturdy. Great choice and highly recommended. Rated 5 out of 5 by TCJan from Great product I purchased this shower chair for my husband to use when he was ill and too weak to stand in the shower. It was so easy to put together, no tools required. It is the perfect shower chair, it has arms to help with lifting and a nice back for support. I highly recommend it. Rated 5 out of 5 by marco from Worth the Price! This chair is sturdy and fits well in the shower. Glad we bought this. It will last for many years.